Encouraging guests to Book Direct is a mission with us just now and every phone call we have with our clients aims to drive that message home. 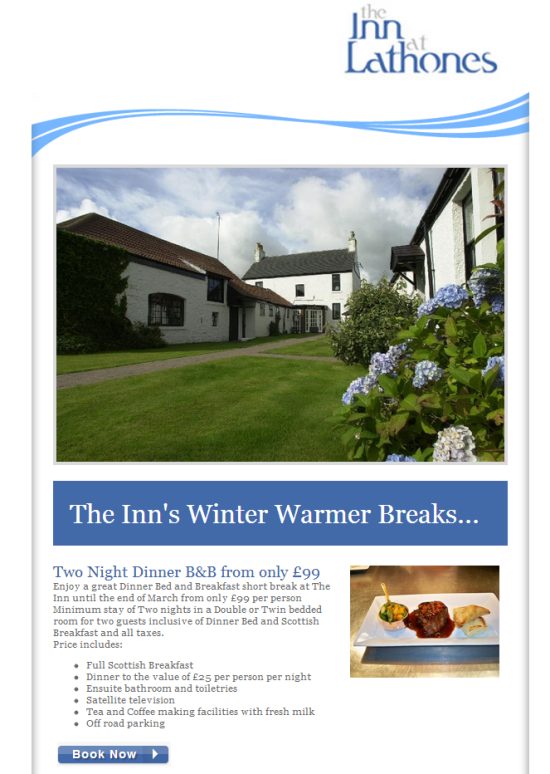 Last week we designed a quick offers template for Nick White at the Inn at Lathones near St Andrews to promote his onlien deal for January through March. The offer is only bookable online and using Price Groups we have linked the offer DIRECT to the booking page for the deal on his own website. 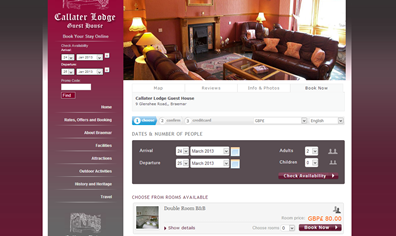 The customer doesn't need to search for the booking page, the specific offer or even the calendar. And importantly because the offer is using the online booking engine the phone lines don't melt under the weight of calls as they do with Flash sale promotions. The easier you make it for the customer to book the room the greater the conversion rate will be. It's not difficult to increase your DIRECT business it jsut requires a bit of thought and consistency and commitment to offering the best rate direct. 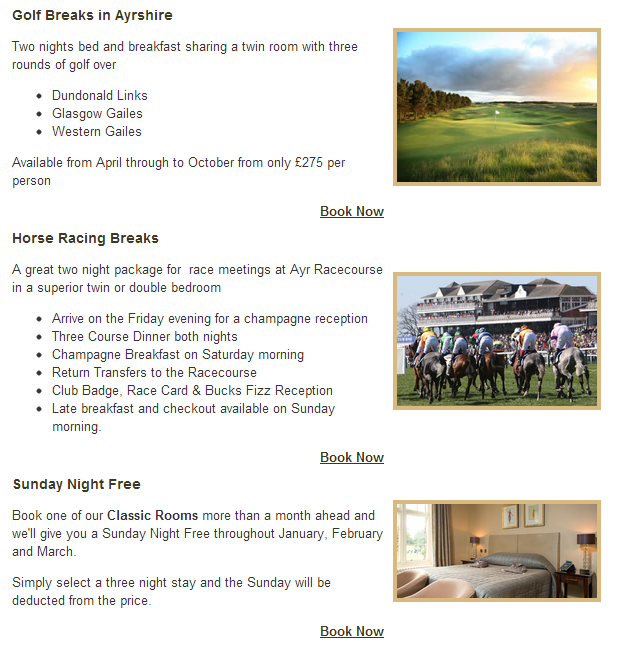 Here's how the newsletter built using ConstantContact looked going out to the Inn at Lathones mailing list. Many operators throughout Scotland will have a working relationship with Abbey Tours. The following is taken from their recent press release. Abbey Tours Scotland announce changes in the structure of their Edinburgh based operation, effective from February 1st 2013. Having set up Abbey Tours Scotland in 2008 and overseen its development and growth over the intervening 5 years, Julie Morris has decided to step down from her current position of Managing Director and concentrate on providing consultancy services to the travel and leisure industry through her company Hotel & Leisure Solutions. Commenting on this development, Abbey Tours Scotland Chairman, Brian McColgan paid tribute to Julie Morris for her outstanding contribution to the success of Abbey Tours Scotland. ‘As our Managing Director, Julie has been instrumental in the successful set up and development of Abbey Tours Scotland. She has helped us build a strong team of experienced travel professionals in our Edinburgh office and this year we expect to handle in excess of 18,000 clients into Scotland. Julie will continue to work with Abbey Tours in a sales consultancy role. We wish Julie every success in Hotel & Leisure Solutions and we look forward to continuing our close working relationship’. Julie Morris also commented ‘I am greatly looking forward to this new chapter in my professional career. Having spent 5 years setting up Abbey Tours Scotland and establishing the organisation in Scotland, now was the right time to move back into the area of travel and leisure consultancy. I wish Abbey Tours continued success and look forward to working closely with them in the future’. Abbey Tours Commercial Director, Rebecca Brooks, will now take up the role of Managing Director of Abbey Tours Scotland. A lifelong tourism professional, Rebecca has worked in inbound tourism to Scotland since 1997 and joined Abbey Tours in 2010. As well as being a Director of Abbey Tours Scotland, she is also actively involved in the industry in Scotland and is a member of the Scottish Tourism Alliance Board as well as the Chair of the SDMA - Scottish Destination Management Association. Glenmorangie, Scotland’s favourite single malt Scotch whisky, has announced a one-year association with legendary golfer Sir Nick Faldo. With career highlights including six major championship wins, eleven consecutive Ryder Cup appearances and 98 weeks spent at the top of the rankings as the world’s No. 1 golfer, Sir Nick Faldo is widely regarded as the most successful British golfer in history and of course in the UK. Sir Nick Faldo was knighted in 2009. As Glenmorangie’s new ambassador, Faldo will work closely with the brand throughout 2013, making guest appearances at consumer and trade events including Glenmorangie’s presence as the official Spirit of the Open at the 2013 Open Championship at Muirfield, Scotland. Sir Nick will also collaborate in various CRM initiatives and the two parties will collaborate on a number of charitable initiatives. “I am very proud to continue to work with Glenmorangie, which I have always regarded as the best single malt Scotch whisky and a leader in its field,” said Faldo. Glenmorangie’s relationship with Faldo is the brand’s latest initiative to connect aficionados of premiere single malt Scotch whisky and golf. Glenmorangie has leveraged its involvement with America’s 27 million golfers to become the fastest growing single malt whisky in the U.S. for the third year in a row. Glenmorangie has also recently received tremendous industry accolades recognizing both its rising popularity but also its heritage and undisputed product excellence, including Scotch Whisky and Distillery of the Year from the San Francisco World Spirits Competition in 2010, Wine Enthusiast’s Distiller of the Year at the 2011 Wine Star Awards and in 2012 Glenmorangie was named a Hot Prospect brand by Impact, the highly respected industry source of reference. Perhaps the greatest recent accolade has been the award of the prestigious title of “Distiller of the Year” this year from the International Wine and Spirits Competition (IWSC) in London where Glenmorangie has consistently won more “Gold Best in Class” medals than any other single malt over the past six years. As we are making the changes and because the upgrade is quite significant, we have been taking the opportunity to review the hotels' current setup in the booking engine and we optimising them for the new booking engine layout. The following gives you some flavour of just some of the improvements this upgrade has brought to the users. 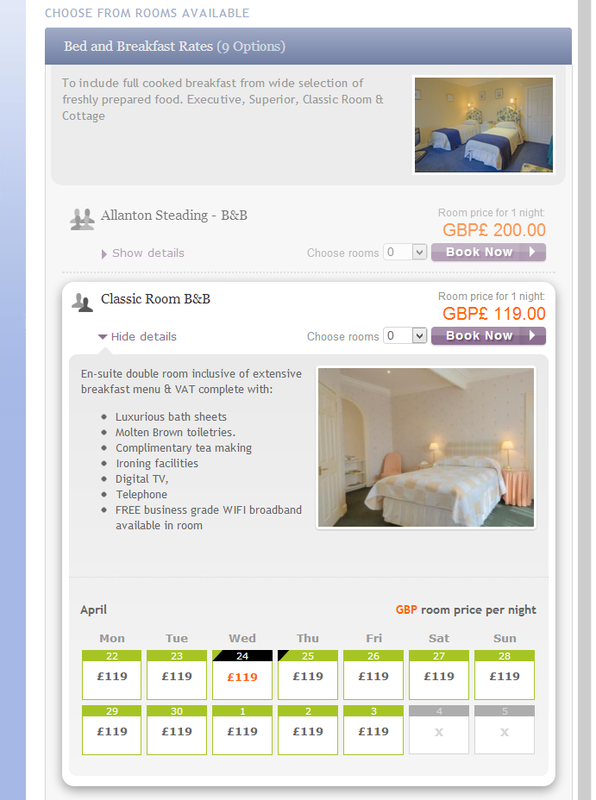 Visually, the design of entire display for the booking pages has been significantly improved to give a fresh modern look. The design makes better use of fonts, font size, colour, layout and style improvements to help make the display more appealing and hence help conversion. Across all pages of the booking engine there is a redesigned top strip indicating the steps 1,2,3 to completion more clearly. We can control colouring much better so that the system blends seamlessly with your website. We have added animations of the customers' actions, for example smooth opening and closing of information sections etc, all of which gives a more dynamic feel to the system and also helps guide the customers' eye to where it should be looking. We have placed a strong emphasis on focus: because the booking options are usually quite complex, we want the customer to be able to focus on exactly what they want so when a user is interacting with a particular room, the system "lifts" it off the page so that it stands out more prominently, as Figure 1 shows. We have changed the color and size of price display for easier viewing. 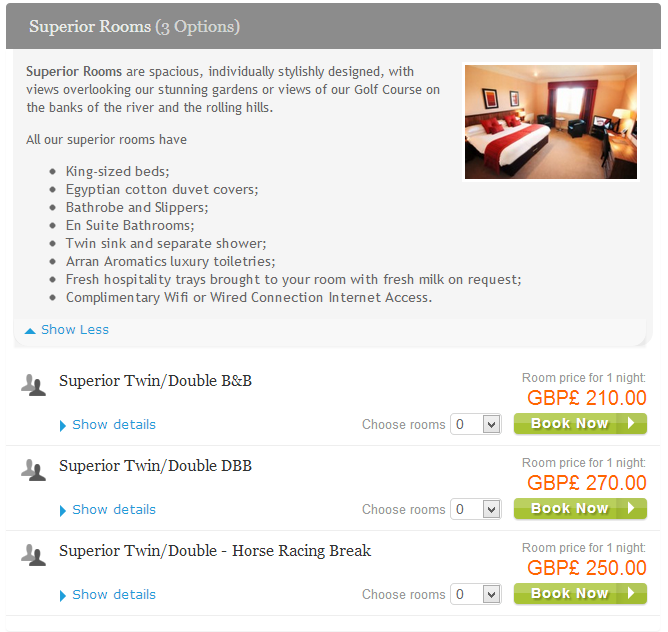 We have redesigned the room description strips with more prominent pricing. We have redesigned the ‘variations’ (room grouping) display into horizontal strips per variation with better photo and details display, plus consistent design with regular room strips for easy comparison as Figure 2 shows. A strong selling point of Bookassist's World-leading booking technology is the Dynamic Discounts function. This booking engine upgrade takes this winning concept even further. Using a calendar-like display, we show a price range (from aaa - to bbb) on non-stay dates and we clearly show the discounts that are available on those dates. You can now open/close Dynamic Discounts on specific dates instead of just on arrival dates. You can have a discount price of €0 to provide an extra free service instead of an actual discount. Photos have been restyled and replaced by flexible-width photos that automatically re-size with the page width. We now store your hotel's booking engine images on the Amazon cloud so that image files are automatically copied to servers all over the world and are "locally" accessible in your customers' country. This provides much faster download times for your customer and improved display of photos. We have strongly enhanced the way in which we give feedback to your customer when they enter incorrect information or attempt to book unavailable rooms etc. Message wording in all error dialogues are much improved to help the customer better understand the problem and point out the options to resolve the error quickly. Error messages are better "localised" on the page to where the specific problem is so that resolution is easier for the customer. Graeme Dey MSP and Go Rural are hosting a discussion on rural tourism on Tuesday 29th January at the Scottish Parliament. We have 10 places for members of the Scottish Tourism Alliance. The event is from 6pm to 8pm. If you are interested in how Scotland engages City residents with rural tourism and leisure businesses and how best small rural businesses collaborate with each other to deliver an authentic, quality experience then come along. I will be feeding back some findings from my Nuffield Scholarship study in New Zealand and Australia. The organizers require to have names registered for security purposes by close of play Thursday 24th January 2013 and you should register using this link if interested. Go Rural Scotland is a new initiative which was launched in July 2012 to encourage Scottish City residents and City visitors to make multiple trips into the countryside within 90 minutes of the City. Go Rural aims to engage with consumers and encourage them to into rural areas of Scotland, from a weekly visit to a farm shop for food shopping through to a day out undertaking activities with the family, short breaks and longer holidays. Farm produce and local food and drink is an integral part of the Go Rural experience. Go Rural would like to encourage more collaboration and joint working between Go Rural members and other businsses in their local area. Rural Scotland has a large population of potential consumers on its doorstep both from Scottish cities but also from the large number of visitors coming to Scotland. There is potential to increase the amount of interaction between rural Scotland and the towns and cities of Scotland. This could have health beneftis for the Scottish population and economic benefits for the range of small rural businesses which Go Rural promotes. According to the SGU website a free and easy to use new online system that helps golf courses manage themselves more sustainably and efficiently has been launched by The R&A. CourseTracker was unveiled at the British and International Golf Greenkeepers’ Association (BIGGA) Turf Management Exhibition 2013 in Harrogate. CourseTracker is designed for golf course managers and club secretaries to record the income derived from the course and what is spent on its maintenance. The secure system allows golf clubs to monitor their performance over time and identify strengths, weaknesses and areas where savings could be made in terms of energy and water, for example. CourseTracker also enables golf clubs to anonymously benchmark their performance against that of other clubs of a similar size in their country. It produces accurate performance reports for the use of course managers and club secretaries and can be used to keep committees informed and to aid decision making. The system has been extensively tested with course managers, club secretaries and industry bodies and their feedback has been used to develop and refine its range of functions. It has been endorsed by England Golf, the Golfing Union of Ireland, the Scottish Golf Union and the Golfing Union of Wales. Around 50 representatives of the golf industry attended the launch at a special ceremony in the Majestic Hotel in Harrogate close to the exhibition centre. Steve Isaac, Director – Golf Course Management at The R&A, said: “There is more pressure than ever on golf clubs to make the right decisions to manage golf courses sustainably, efficiently and cost effectively. CourseTracker can help them do that through recording, monitoring and reporting their activities and inputs. We know this is an area where many clubs struggle due to lack of time and resources. Paul Keeling, Club Services Manager at England Golf which has supported CourseTracker, added: “CourseTracker is an excellent new resource for golf clubs which can really help them get a grip on their expenditure on course maintenance. CourseTracker can be accessed online at www.coursetracker.org. Golf clubs need only spend a few minutes registering before using the system. It is simple to use and there are full online tutorials available for guidance. THE splendour of the Torridon mountains is set to be the star of an international TV advert aimed at luring domestic, American and European visitors to the great outdoors of Scotland. The commercial is part of VisitScotland’s biggest ever nature-focused tourism drive, highlighting the country’s natural environment. It is designed to get the Scottish population out of their armchairs and into the countryside for the Year of Natural Scotland 2013. This £3.4 million campaign — tipped to bring a return of some £68million to the Scottish economy — will target the key domestic market as well as North America, Germany, France, Spain, Italy, the Netherlands and Scandinavia. It will feature a new television advert highlighting mountain biking in Torridon and the beach at Arisaig. Other activity includes a major ticket giveaway from Scottish transport providers which will see at least 15,000 people enjoying free travel during April - allowing them to visit a Scottish island or to travel all over Scotland - courtesy of Caledonian MacBrayne, Northlink and ScotRail. Coach operator Stagecoach has also offered 5,000 money-off vouchers that can be redeemed throughout the month of April. Scott Armstrong, VisitScotland regional director, said: "The Year of Natural Scotland is a wonderful opportunity to showcase the Highlands’ spectacular natural environment and I’m delighted that millions of potential visitors will again see Torridon and Arisaig throughout the next twelve months in our new television and cinema advert. "The Highlands boasts some of Scotland’s most beautiful coastlines and countryside. "The Big April Adventures" is an incredible opportunity for people to travel to our region and enjoy our landscape for free. We are extremely grateful to Calmac, ScotRail, Northlink and Stagecoach for their generosity in this Scotland-wide initiative and we hope that as many people as possible sign up for these tickets and experience our beautiful country for themselves." Click here for more information on the Year of Natural Scotland. There are so many things that can turn off your site visitor from booking. Hide away the availability checker, have too many levels, not showing best available rates or in this case not making it easy to find the room options available. It is extremely important that you spend some time optimising your room descriptions, images and even order to ensure that your guest can book the room that they wish. Bookassist have made this even easier to do now and we thought it worth while looking at what you could or should be doing. Now, at the outset is that there is quite probably no right and wrong in how rooms should be set up but if you follow your own "customer journey" through your own booking pages you'll be able to identify where the hurdles are and then you can remove them. However on most occasions we are recommending to accommodation providers that they promote two routes to their bookings - by Room Type and by Promotional Package. Bookassist can sort your rooms and packages into Variation Groups. In ordinary English that means that you can create a variation group that describes the generic room type and then you can sell the various package options underneath it. Variation Groups are viewed once the site visitor has clicked on the availability checker. The order of rooms and packages can impact on the conversion of lookers to bookers and it is important that thought is given to how providers list their product. A variation group can be seen as a type of folder holding each of the packages relating to that room underneath it. We recommend sorting your packages in this way as it means that the guest can systematically see the options by room type and the accommodation provider can make it easy to upsell packages form a basic room. The booking engine allows the accommodation provider to move the order of the packages and indeed the variation groups themselves using an easy drag and drop facility to make sure that the most important packages can even temporarily be moved to the top of the page. From the customer perspective they can see the room description at the top and then read only the detail of the specific packages below. A/B testing has overwhelming shown that the new layout converts at a higher level than the old route. In addition to the sort by room type in the availability pages we always recommend that accommodation providers create a dedicated Promotions or Special Offers page on the website. Your customer is looking for the deals so you may as well sell them direct rather than through expensive third party channels. Price Groups work by allocating unique codes to packages or groups of packages to allow the visitor to click directly on the specific promotion without having to go through layers of date and room type information. It is proven to increase conversion rates in promotional packages. In addition Price Groups can be used to promote email campaigns and in house "flash sales" (See Mar Hall Case Study) often with extraordinary results. Simply add a price group to the package being promoted and use the direct link to the package in your mail, social media and website. Bookassist allows the accommodation provider not only to control the content and order easily but also to mange the look and feel of the booking engine itself. Web designers can easily change the CSS code to ensure that the booking pages are styled to suit the website design. The Riverside Inn just south of Ayr along the busy A77 has closed for an extensive refurbishment programme and is expected to reopen in spring 2013. 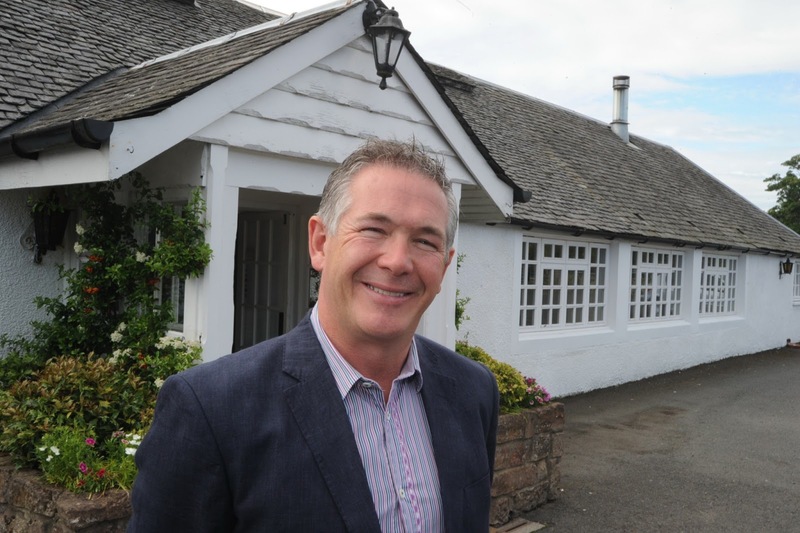 Last year, The Riverside Inn was bought by SimpsInns, one of the leading family-owned hospitality groups with bars, restaurants and hotels across Ayrshire. An opportunity arose to acquire The Riverside Inn and owners, Malcolm and Karen Simpson, recognised the potential in the converted farmhouse, which had been operating as a quaint country pub and restaurant. After taking ownership in June 2012 the owners decided to continue trading for the remainder of the season and only closed the doors after recent Hogmanay celebrations. The Riverside Inn sits on acres of unspoilt Ayrshire countryside, mature woodland and adjacent to the River Doon. The premises, though warm and homely, were always in need of upgrade and refurbishment. That said, it didn't stop leading restaurant critic Tam Cowan heap praise on The Riverside Inn on his visit there in 2012. The Simpsons feel now is the right time to carry out the refurbishment project, which they hope to have completed in time for spring this year. The Waterside – Seamill, West Kilbride. In 2013 Si! Café:Bar:Restaurant and Si! Italia will open on the Kilwinning Road in Irvine.